Owners of solar power systems are discovering battery storage as a way of further reducing their power bill. For those not receiving the (PFiT) due to re-structure of the feed-in tariff, Battery Energy Storage offers a unique opportunity. Consumers are now fighting back by storing any excess solar (or PV) output. Solar Charge has found the early adopters very keen on not giving the Electricity Retailers a "free kick". As prices of home battery storage/ hybrid power solutions drop, the expected uptake is huge. LG Chem, a division of LG Corporation who also manufacture Tier 1 Solar panels in Korea have just released their RESU 6.4 lithium-ion storage solution to the Australian market. These units are expandable 12.8 kWh to suit the typical house loads. The technology delivers at 48Vdc, much lower than the Tesla Powerwall which is a scaled down version of the Tesla Car battery. The LG Chem product is competitive on cost for home applications. "Our customers who have taken up this technology are now using battery stored solar power when peak electricity tariffs would be charged" says Solar Charge Director, Richard Potter. "Savings vary according to household consumption patterns". Solar Charge offers both sealed lead-acid and Li Ion solutions along with the locally manufactured Selectronic SP-Pro My Grid systems. "In fact all our PV/ Solar power systems can by upgraded to Battery Storage" says Richard. The LG Chem solution can also be used in off-grid applications, but larger capacity lead acid batteries are more common. "We have been installing solar with battery storage systems since the 1970's. It is great to see these latest battery developments come on-line" says Richard. The Bosch Power Tech group is introducing a new range of Hybrid inverter systems to Australia. Users are not limited to when they use the solar power; they can now draw power from the battery storage during times of high electricity charges. These systems have a fully integrated energy management system with output power of 5kW and storage ranging from 4.4kWh to 13.2kWh. The systems come in a neat cabinet with integrated colour touch screen display on the front to keep the homeowner informed of performance. The systems use lithium ion batteries for excellent storage/ weight ratio. Solar Charge is pleased to be involved with the Sustainable House Day on Sunday September 8th. Many homes around Melbourne and Victoria will be OPEN to visitors. It is a great opportunity to view how homes can be built or renovated with energy efficiency in mind. We are pleased to announce that the multi-award winning home of our Managing Director will be open in Sandringham from 10am to 4pm on that day. This home incorporates double glazed windows, thermal mass, solar power and hot water, north facing living spaces and a host of other features. Product representatives will be on hand to explain the various features including the Award winning Designer from Solar Solutions. Contact Solar Charge for Details of Opening hours and location. 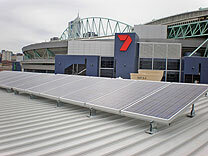 Solar Charge has been installing quality BP Solar and now Bosch Solar panels in Grid Connected applications since 1998. Although panel problems are rare, some early Inverters need attention after 10 years. With over 40 years experience with solar power, Solar Charge now offers this service and maintenance to other Melbourne based Solar Power (PV) systems. The huge uptake of solar in Melbourne over the past 5 years has seen "the good, the bad and the ugly" installed by some companies in the industry; many of whom have now closed their doors. As some of the cheaper equipment fails, Solar Charge through our installers can offer a service visit to repair or replace faulty components. Is the correct (usually green) light showing on the Inverter? Is the Peak output (watts) still good on a clear sunny day at noon? Does the total energy generated by the Inverter (kWh) accord with the expected yearly output as quoted by the supplier? The overheated manufacturing capacity of China, which has been responsible for the over supply of panels into Australia and some bargain basement pricing, looks like a pack of cards on the brink of collapse. Renewable Energy sector policy makers in China acknowledge there are too many manufacturers and expect a huge contraction. "If one-third of them survive, that's good, and two-thirds of them die, but we don't know how that happens," said Mr Li Junfeng, a longtime director general for energy and climate policy at the National Development and Reform Commission, China's top economic planning agency. Australian households that install the cheaper Chinese offerings are understandably nervous about their warranty backup. This has resulted to a "flight to quality" where people are prepared to pay more for a well backed up system from a reliable supplier and name brand manufacturer such as Bosch Solar. Stories on forums like NotGoodEnough.com.au about poor service and products offered cheaply in Australia go further to prove the adage that "you get what you pay for". Once again the Government (Federal this time) has fiddled with the Solar Credits policy settings doing its best to discourage the uptake of Residential PV. Canberra announced on Friday Nov 17th that the 2 time multiplier for RECs available to solar power purchasers is to be removed from January 1st 2013. Again, an industry reeling from changes in Feed-in-Tariff rates, takes the brunt of poor policy decisions. The good news in all this for consumers is that PV/ Solar Power is having a real impact on power production, particularly when the power companies are starting to charge much higher "peak" tariffs to penalize those with heavy loads in the afternoon like Air Conditioning. Home owners are increasingly aiming their PV panels west to combat this peak tariff. 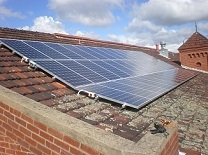 Solar Charge is carefully examining customer roofs to ensure best benefit is obtained in the new tariff regime. Installations on small to medium commercial and community buildings have increased over the past 6 months. Solar Charge recently completed a 10 kW system on the Don Bosco Youth Hostel in Brunswick to help offset their daytime loads. Managing Director Dr Richard Potter said: "Electricity Tariffs are becoming more expensive during the afternoon period when air conditioning loads are turned on. To combat this, the array shown is installed facing west to maximize the offset of these higher tariffs." Commercial premises are well placed to invest in solar power. Quality equipment ensures longer life and a sound long term return on investment. Careful consideration must be given to the orientation of panel arrays to maximize power production during high power use and especially in the peak periods. The rush of installations in September provided a challenge to deliver on both quality solar system installations and submission of all the paperwork in a timely manner to the power companies. Late paperwork could result in missing the close of the Transitional Feed-in-Tariff (TFiT). Customers had chosen Solar Charge based on its reputation to deliver and look after the details. The office staff team led by Tina excelled under pressure and delivered 100% for all customers. It is now in the hands of the Electricity companies to install the solar metering in the timeframe outlined by the Essential Services Commission. Tuesday 16th October 2012: Solar Charge was pleased to receive a visit from the VP for Sales from Bosch Solar Energy in Germany. Stefan Thiel is located in the Arnstadt factory in Germany where the Bosch panels are manufactured. He reinforced the quality message that manufacturers like Bosch bring to their product. Stefan has been involved in the German Solar Power industry for 8 years and sees the stability of companies like Bosch as key to the long term success of solar power worldwide. Higher Electricity Tariffs and the new lower solar export tariff being introduced by the Baillieu Government in Victoria means Medium Sized Businesses will benefit most from installing solar power on their commercial premises. The Business Development Manager at Solar Charge, Peter Israel, sees great prospects for business owners who install solar panels on their premises to offset power used during the day. "It can suit to put a portion of your solar panels facing west to offset higher peak afternoon tariffs." 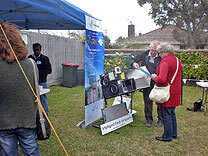 Sustainable House Day in Sandringham a Success! For the 6th year our Managing Director's Award Winning home was open for Sustainable House Day on Sunday 9th September. 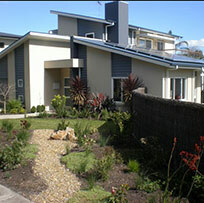 Tours of the home featured thermal mass and double glazing along with the solar power and solar hot water systems. This year a highlight was the home's Solar UPS system that incorporates Battery Storage for better use of solar power. Attendees also had an opportunity to discuss their individual interests with Product Suppliers. 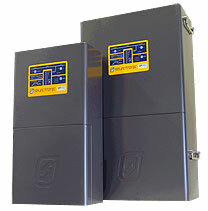 The much anticipated new SP Pro Inverter/Charger has been released by Selectronic. This remarkable Inverter gives both off grid and on grid applications. 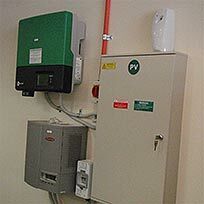 When used in the suburbs, even with a pre-existing solar Inverter, the home can have the security of battery back-up. If the battery bank is large enough, the home can make the best of peak/ off peak electricity tariffs by running from storage during the higher peak rates. Solar Charge is once again proudly exhibiting at the HIA Build Green Expo at the Melbourne Exhibition Center, Southbank from August 16th to 19th. This is held in conjunction with the Herald Sun Home Show for 2012. A long time participant in this show, Solar Charge was once one of only two to exhibit solar. Managing Director Richard Potter said "It is pleasing to see the increased public awareness of solar power systems here in Melbourne. The consumer is now keen to ensure they seek out a quality product which is why Solar Charge offers German made Bosch Solar panels and SMA Inverters." Richard will be presenting at the Sustainable Living Stage on Thursday at 11am and Sunday at 3pm. His topic is how Solar Power can help fight rising electricity prices. Alternatively you can visit Stand P47 to explore our solar power systems.